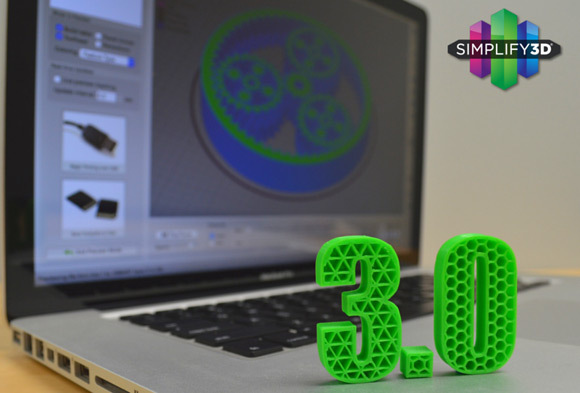 Simplify3D has just announced a new major release version 3.0 of their universal 3D printing software bringing a lot of new features and improvements, including support for many new devices. We have been using the Simplify3D (commercial 3D printer slicer) for quite a while along with our MakerBot Replicator 2 3D printer for quite some time already and it has always been a good alternative to the standard MarkerBot Desktop software. The Simplify3D software offers more flexibility and features, allowing the more advanced users to have much more control over the printing process than standard stock slicers usually allow. So always a good to have if you are having trouble printing a model using your stock slicer software that came with the 3D printer you are using. Not to mention that due to the very large number of supported devices you can change your 3D printer in time and most likely still have it compatible with the Simplify3D software. – Dual Extrusion Wizard: The new Dual Extrusion Wizard simplifies the steps involved in configuring a dual extrusion print. With only a few clicks, users can create a beautiful two-color part. Depending on the type of model, users can choose from a variety of “ooze shield” shapes, which will surround their part during construction and provide crisp, sharp definition between colors. – Infill options galore: Simplify3D now boasts six infill pattern options, including the popular honeycomb and triangle infill patterns. The new variety of patterns allows users to configure the interior of their part exactly how they want it, whether the goal is to achieve high strength requirements or for stunning aesthetic results. – The fastest slicer gets 3x faster: Simplify3D has always been known as the fastest slicer available. New state-of-the-art algorithms in Version 3.0 result in slicing speeds more than three times faster than the previous version. This enables an impressive time savings compared to other 3D printing software. Faster slicing helps with complex models and multi-part jobs, but it also allows for faster iteration. Combined with our realistic animated Preview Mode, this allows our users to make small settings changes and instantly see how they will affect the final print. – User-friendly interface updates: The interface has been revamped so that frequently used tools are more intuitive and easier to use. Model manipulation is easier than ever before, and new grouping options make it incredibly simple to work with multiple parts. An “undo” button saves time and frustration while new keyboard shortcuts improve navigation. The Preview Mode has also been enhanced with multiple coloring options so users can visualize their build sequences by speed, active toolhead or feature type. – New settings boost quality: Simplify3D 3.0 provides dozens of other new features to improve print quality, such as Avoid Crossing Outlines, which alters the movement of the toolhead to reduce excess oozing, and Non-Stationary Retractions, which helps reduce defects (a.k.a. “blobs” or “zits”) on the outer surface of the print. These fine-tuning controls improve even the most challenging prints, and make the difference between a good print and an excellent print. – Smarter printer profile system: Anyone who has modified their print settings to get the best results knows the importance of saving successful settings. Simplify3D 3.0 provides a brand new printer profile system that simplifies the process of adding and saving profiles. For owners of multiple 3D printers, this streamlined profile system greatly simplifies the workflow. In addition, to make sure the profiles are always up-to-date, the desktop software communicates with a new cloud-based storage system to receive instant updates for the hundreds of pre-configured printer profiles that are available within Simplify3D. – Support for 25 new printers: Simplify3D is committed to universal compatibility, and previously supported more than 100 printers worldwide. In the latest release, they have added 25 new pre-configured printer profiles: Bonsai Lab BS01, bq Prusa i3 Hephestos, bq Witbox, DeltaMaker 3D Printer, FusionTech ideaPrinter F100, gCreate gMax 1.5 XT, German RepRap PRotos V3, German RepRap X350, LulzBot Mini, LulzBot TAZ 5, Malyan M180, Mankati Fullscale XT, MendelMax 3.0, Printrbot Plus Single, Printrbot Plus Dual, Rostock MAX v2, Sharebot Kiwi-3D, Sharebot NG Dual, Sharebot XXL, Solidoodle Press, Solidoodle 4, Solidoodle Workbench, Tumaker Voladora, Ultimaker 2 Go, and Ultimaker 2 Extended.